All the usual protests have emerged from the anti-war movement in recent weeks: our motives may be no better than theirs, intervention will only incite more animosity among East-West relations, there are worse dictators about. I want to challenge the validity of each of these, and moreover, to suggest that they function only as distractions from the really important issue. Doubtless, there are strategic advantages to Libyan intervention which make it a favourable target for military intervention. The first thing to note is that it has the 10th largest oil reserve in the world, and has one of the largest GNP per capita in Africa. 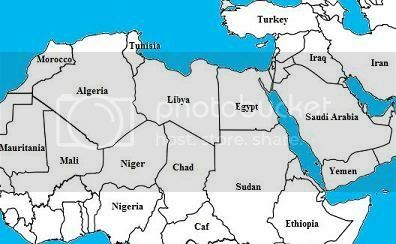 Most of Libya is Sahara desert, and the vast majority of its small population lives at or near the coast, making it easily accessible both in trading and military terms. It's also sandwiched between the Middle East's two newly revolved democracies, Tunisia and Egypt, so a regime change would help to create a band of young democracies, with newly formed strong ties to the West; for these reasons it serves as a potential lynch-pin in the Middle East. For all these reasons, among others, we might be skeptical of any Western involvement (or equally, we might be elated, depending on our perspective). But since we're assessing motives and incentives: what about the dictator's own? Firstly, the colonel receives some support among sympathisers for having accepted the Nuclear Non-Proliferation Treaty in December 2003 - despite this being a matter of weeks after the US invasion of Iraq, and despite his continued attempts to get hold of nuclear weaponry for the preceding 31 years. In December 2003, the idea that the world's primary superpower was toppling regimes because they had nuclear weaponry was still a popular one, so I shouldn't need to spell this out any clearer. Is it too brusque to suggest that Gaddafi's own intervention might have been inspired by the wealth and power which comes with oil? Is there not something unctuous about this man? So What Does Gaddafi Spend His Money On? Despite Libya's respectable GDP per capita, the majority of its citizens are forced to live in abject squalor. At the beginning of his reign, Gadaffi nationalised and socialised the economy, completely abolishing the private sector. As a result, the eastern half of the country slipped into poverty; it is possible that this state of affairs could exacerbate an already vitriolic rivalry between the eastern and western regions of Libya. The Gaddafi family lives in opulence. Throughout Gaddafi's reign, most of his wealth has been spent on funding terrorist programs against Western countries. Gaddafi was connected to the Berlin Discotheque bombing of 1986 (an action which led to a retaliatory massacre by the no-less-ghastly Ronald Reagan) and funded the IRA from 1982-1987, providing semtex, flamethrowers, Kalashnikovs and a plethora of other arms and ammunitions. When the treasury began to run dry in 2003-2004, Libya opened more than 40 embassies with other countries to stimulate its economy. Part of these newly formed international relations involved buying weaponry (a standard practice for a Middle-Eastern state) from Russia. In February this year a Libyan transport plane was reported to have visited a military stockpile in Belarus, one of Europe's last remaining authoritarian outposts. A 2004 report from the Chemical Weapons Convention verified that Libya owned 23 metric tons of mustard gas and a further 1,300 metric tons of precursor chemicals. Gaddafi funds both foreign and domestic aggression by means of hiring mercenaries. In 1987, an offensive into neighbouring Chad was launched, sparking an ethnic conflict which would later lead to genocide. Most of the soldiers in Gaddafi's army were mercenaries hired from Pakistan and poor Sahelian countries. Again, in March and April 2011, the Gaddafi loyalist forces have been comprised mainly of Serbian and Ukrainian mercenaries, massacring protesting Libyan citizens. When Gaddafi assumed power in 1969, he instigated a nationalist form of socialism, dubbing his regime the "Third International Theory" (does any of this sound familiar?). Shari'a became the official doctrine of the state, and alcohol and gambling were outlawed. Dissenters, as well as deserters, were imprisoned without trial. Many were hung in public stadiums and broadcast on television. Death squads, composed of revolutionary committees, were formed in order to hunt and kill dissenters. Gaddafi's entire reign has been tainted (if such a malodorous monstrosity can be tainted) with racism; despite the existence of Berber tribes in Libya, Gaddafi has always refused to recognise the Berber presence. Persistent Persecution of Jews - religious and racial - has caused the Jewish demographic of about 36,000 to almost entirely dwindle, largely through emigration. In 1996, nearly 1,200 prisoners were massacred in Abu Salim prison at Colonel Gaddafi's command, as a punishment for demanding fair trials and palatable living conditions. Most notoriously, 270 people (259 on board and 11 on the ground) were killed over Lockerbie due to a bomb that Libyan-backed terrorists had planted on an aeroplane. Gaddafi is also suspected in connection with the bombing of UTA flight 772 in 1989, which cost the lives of a further 171 people. In 1987 the Islamic Legion began a series of regular raids across the Libya-Chad border, and stationed 2,000 troops in Darfur. The resultant conflict and trauma escalated into a genocide, with around 9,000 lives lost. Many members went on to form Janjaweed, a genocidal organisation that has ranked up a murder toll with estimates ranging from 19,500 to 400,000 losses. The 2011 protests had resulted, by february 2007 (long before any UN, US or NATO intervention, and when Libya was just one Middle Eastern country among many facing protests) in a death toll of more than 400, as the Libyan military was opening fire on rioters. On March 21st, civilians were being used by the loyalists as human shields. Let us not forget that this ogre is only in power in the first place, by means of a usurpation; so, even had all these acts been moral and legal, he would have had no mandate to any of them. Won't This Increase Animosity Between Us And Them? There's a current of non-interventionalist thought, not worth overlooking, that the populations in the region view western states such as the US and UK as hypocritical, hamfisted, bloodthirsty and oilthirsty. This is not unjustified, as the henious records of men like Reagan, Kissinger and Clinton will testify, as well as the ongoing US support for Israel's crimes against Palestine. On the other hand, Gaddafi isn't popular in the region either, and our failure to act may easily (and justifiably) be interpreted as support for him. Firstly, the Arab League already cut its ties to Libya, declared the regime illegitimate and requested a no-fly zone over the country. This is not an insignificant act. Secondly, there's a newly formed democratic administration on either side of Libya, which shows that the zeitgeist among the region's populations is shifting, as they begin to favour western ideals. Thirdly, Gaddafi's relations with the surrounding countries have never been endearing. Continually refusing to recognise Israel as a state, and calling for its destruction, Gaddafi has vetoed any attempts at diplomatic relations between the two countries. At the Arab League summit* in 2009 Gaddafi was petulant toward King Abdullah of Saudi Arabia; he maintains poor relations with Tunisia and Morocco. Back in 1971, near the beginning of his reign, Gaddafi attempted to merge Libya with Sudan, but president Nimeiry declined, saying: "He has a split personality -- both parts evil." January 14: Tunisia revolts, and declares Fouad Mebazaa president. February 11: Egypt revolts, and Suleiman announces Mubarak's resignation. February 23: Bahrain leaders free political prisoners to pacify protestors. February 24: Algeria lifts the state of emergency, to appease the population. March 9: King Mohamed VI promises Morocco constitutional reforms. March 10: Saleh promises constitutional referendum. March 13: In Oman, legislative power is delegated to people outside the royal family. March 14: King Abdullah of Jordan sets a 3 month deadline on constitutional reforms. March 15: The government of the United Arab Emirates agrees to greater media transparency. It is true that various less promising events have occurred, such as imprisonment of, or violence toward, protestors in several countries. The unrest so far has consisted of a tug-of-war between oppressed peoples demanding dignity, liberty and security, and states trying to maintain their authority. Some states - such as Morocco - have been frequently violent; some - such as Bahrain - have been consistently oppressive. But only one state has been consistently, frequently brutal toward any attempts to challenge its regime, and that is Libya. So here's what it all pivots on: if outside forces fail to act, Gaddafi will crush the rebels, set an example to the Arab world, and the domino effect in the Middle East will doubtless cease. The prolongation of theocracy and despotism will be indefinite. Alternatively, we can set the example ourselves: that there is hope for revolution, and these struggles have not been and will not be in vain. Just as Gaddafi learned in December 2003 to abandon his nuclear weapons program, the regimes of Morocco, Mauritania, Oman, Yemen, Iraq, Iran, Bahrain and Syria can now learn to treat protests with care. As Philippe Legrain put it: "whatever happens in Libya in coming weeks, don't forget Gaddafi vowed to slaughter people of Tobruk & Benghazi house by house." "Western nations only invade states when they want oil"
"Western nations only support dictators when they want oil"
The mutual cancelling of these complains should be obvious enough; apparently, anything we can possibly can only be done out of a desire for oil. So, it makes no difference whether we intervene or not, there will still be those claiming that we are simply exploiting the nation. Either of these claims might be easier to defend, were it not for the fact that, in March 1982, an embargo was placed by the US on government on all Libyan oil. This no-trade policy continued, in effect, until 2004, when Gaddafi's terrorist project began to lack funds, and then new embassies were opened between Libya and the West. If the objective here were oil, why would 32 years have passed with no action from the US? Why would they wait until the embassy were open? Why not invade in late 2003, when there was no trade and no embassy - particularly given that many claimed the invasion of Iraq was oil-motivated (and not without good reason; the original title for Operation Iraqi Freedom was "Operation Iraqi Liberation"). "Libya is the military soft touch of the Middle East"
Again, this leaves too many questions untouched: why didn't we invade it in 2003? Libya's military credentials have never been as strong as Iraq's and particularly so in 2003, before Libya opened its embassy with Russia (whence it acquires most of its military stock). "Why leave it until now?" "Why not one of the worse dictators?" This is another set of cancelling complaints. Do we really have to draw up a league table of dictators? Fine then; with a couple of exceptions aside, most despots don't rise straight to the top of the league table. Particularly in Gaddafi's case, it has taken the accumulation of years and years of smaller atrocities. By the time his track record reaches the status of one of the worst, he's already been in power for almost four decades. Given the consistency of his thuggishness, ought this man be given any more mitigation? "Aren't the rebels' motives questionable too?" Well, arguably. The original protests in Libya were calling for the emancipation of Ferthi Tarbel, a lawyer banged up for his activism regarding the 1,200 massacred in Abu Salim. These 1,200, it should be noted, were members of a militant Islam group; but this is a tenuous link at best. The protesters were rioting and throwing stones, but stones don't compare to war-planes. In the worst case scenario, then, we have one proven radical-theocratic dictator at war with a group of possibly radicals. If this does turn out to be an Islamist skirmish, all the more need for UN presence, to ensure that the victorious regime is nothing too extreme. I will grant Ahmedinejad this claim, because it's patently true, and shameful. So we have two choices: continue to stand with dictators, or not. And hopefully it has been illustrated that the Western motives can't be explained away, this time, in terms of oil. A slightly more refined charge is that the US & co. only stand with dictators as long as they remain stable. This may well be true, and is consistent with the current case. So, let's give the people of the Middle East an incentive to destablise their dictators. Alot of the anti-war movement, I think, is motivated by a kind of knee-jerk reactionism; "the West has made too many mistakes in the past". But our mistakes run both ways; our failure to intervene in Rwanda and Bosnia is no more admirable. * And here is a further point about motives: it may be suggested that Gaddafi's attempts at uniting Africa have been somehow progressive. But he did not simply want a United States of Africa; he presumed the title "King of Kings", and nominated himself "leader of the Arab leaders" and "Imam of the Muslims". To me, "progressive" seems like too generous an accolade.